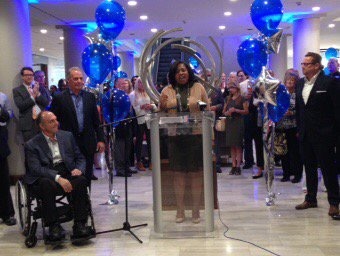 Mayor Lovely Warren’s political action committee, Warren for a Stronger Rochester PAC, essentially functioned as a second campaign committee, a potential violation of the law. Rochester for All reviewed four years of election filings. There is considerable evidence that Warren may have created a fraudulent PAC to solicit over-the-limit donations. Public filings indicate she used that money for personal spending and to aid her reelection campaign. Warren appears to have directed donors to jump between her two political committees in order to evade donation limits. The state allows candidates for office to have one authorized committee to raise money and fund their campaigns. Lovely Warren’s authorized committee is called “Friends of Lovely Warren.” No one is allowed to donate more than $8,557 to a candidate’s mayoral campaign over the four-year election cycle. In 2014, the first year of the cycle, Friends of Lovely Warren brought in $323,301 in donations. Her top 28 donors gave a collective $91,649. Nine of those donors were on pace to hit the $8,557 limit, or “max out,” the following year. Warren would hit a fundraising wall if she didn’t think of another vehicle for these donors. In 2015, Warren created a political action committee, or PAC, called “Warren for a Stronger Rochester PAC.” Under state election law, this is known as an unauthorized committee. The PAC is subject to different legal rules. We’ll talk about campaign finance law later. First, let’s talk about the fundraising activities of Warren's authorized and unauthorized committees. In its first year, 2015, the PAC brought in $49,100, including $40,000 from eight of Warren’s top 28 donors. Meantime, Friends of Lovely Warren brought in $228,917 in 2015. Four of the top 28 donors were now officially maxed out, and another seven were on pace to do so the following year. In 2016, Warren was gearing up for her reelection. Yet Friends of Lovely Warren’s fundraising activity slowed considerably. The campaign brought in only $17,380, a 92 percent drop from the year before. Not one of the top 28 donors gave to Friends of Lovely Warren. At the same time, fundraising activity was in high gear for the PAC. The PAC hosted the 2016 Mayoral Ball, Warren’s chief annual fundraising event. That calendar year, the PAC took in $275,870. All but one of the top 28 donors gave to the PAC, giving a combined $120,300. In 2017, donors were sent back to Friends of Lovely Warren. The PAC took in only $20,500, a 93 percent drop. Only two of the top 28 donors gave to the PAC. One possible reason is the PAC's fundraising activities were drawing public scrutiny from Warren's political opponents. But having taken a year off, most of the top 28 donors still had room to give to Friends of Lovely Warren in 2017. Twenty-two of them donated a collective $75,500. Fifteen of the top 28 donors were now maxed out. Another seven were close to the limit. The campaign account brought in $314,445 in 2017, the year Warren faced reelection. 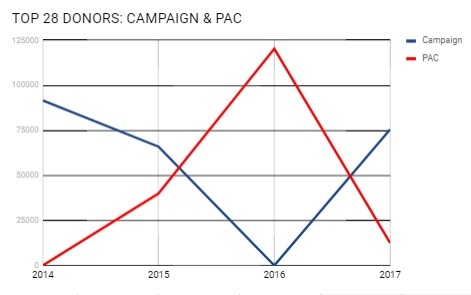 The pattern shows that Warren managed to evade donation limits by getting donors to hop between political committees. Warren got the top 28 donors to give 58 percent more money than if they had been restricted to the campaign fund. That amounts to an extra $138,417. 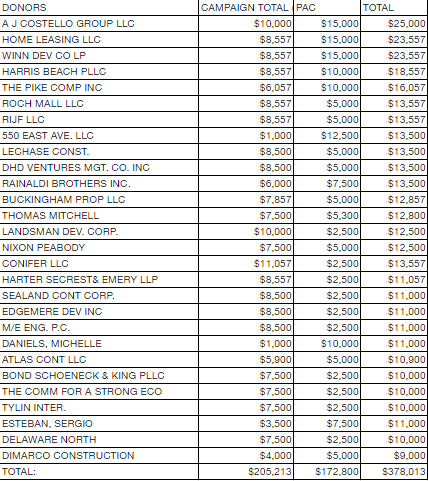 These 28 donors played a significant role in Warren’s fundraising activity for the PAC and campaign fund. They gave a collective $378,013, 31 percent of the $1.22 million raised from 726 contributors over the four-year cycle. All but two of the 28 donors had business interests with city government. - Contributed $378,013 of $1.22 million raised. - Gave 31 percent of total raised from 726 donors. - Exceeded Donation limits by $138,417 by giving to campaign and PAC. - All but two had business interests with city government. Warren's PAC functioned as a second -- and likely illegal -- campaign committee. By mid-2017, Warren had two political committees overflowing with money. But state election law allows candidates to use only one committee to aid their election efforts. Warren ignored the law, using her PAC as a second — and likely illegal — campaign fund. PACs may donate to a particular candidate's campaign committee, but not in an amount that exceeds the donation limit for the office the candidate is seeking. Warren For A Stronger Rochester PAC could only give the legal limit -- $8,557 -- to Friends of Lovely Warren. The PAC blew well past $8,557. It spent money on a makeup artist and photographer on the day of Warren’s reelection announcement. It sent Warren on trips to Miami and Chicago. It paid for Warren to have meals at trendy restaurants. It paid to host a “Distinguished Gentlemen” gala featuring the mayor, high school students and mentors. In addition, there are numerous unexplained payments and reimbursements to individuals. A City Hall staffer, Kiara Warren received nearly $1,000. 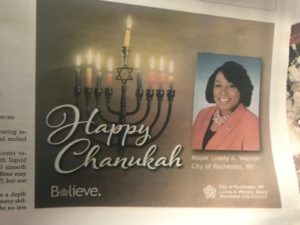 (A city spokesman said in a carefully-worded response to an open records request there is nothing on file at City Hall “documenting a familial relationship” between Kiara Warren and the mayor.) We also don’t know why Warren’s aunt, Mary Hill, was reimbursed for food purchases. We don’t know why her uncle, Reggie Hill, was reimbursed for a trip to the Erie County, Pa. fair. We have no idea why Shaniece Sutton received $1,080 and Yvonne Storti was paid $960. 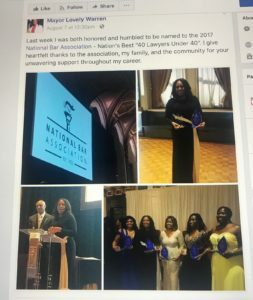 Warren received an award from the National Bar Association, shortly after giving them $2,000 from her PAC. The fund was also spreading money around to promote Warren. The PAC marked many expenditures as "donations." They include outright payments to organizations, churches, food purchases and a tent rental. One donation went to Warren’s sorority. Another went to a legal association that gave Warren an award. The PAC even gave money to a dance camp. An investigation is needed to determine if each of these expenditures count as personal use, campaign expenditures or something else. Warren has said publicly, "People donate to the PAC so the PAC can support things going on in Rochester." First, she's admitting the PAC allowed her to play Robin Hood and curry political favor with constituents. These kinds of expenditures would likely be considered campaign expenditures under the law. Second, if the PAC is a charity, donors would have an expectation their contributions would be tax-deductible. The PAC is not a 501(c)3. Here's another huge problem with the PAC. By law, PACs are only allowed to make direct or in-kind contributions to candidates. Warren for a Stronger Rochester gave only $24,900 directly to other candidates. Meantime, it had $145,654 in other expenditures, many of which clearly aided Warren’s campaign. PACs are not allowed to have expenditures to aid campaigns. Once Warren’s PAC engaged in this activity, it stopped being a PAC. It became a potentially illegal political fund. There's lots of evidence showing Friends of Lovely Warren and Warren for a Stronger Rochester were operated by the same people -- who answered to Warren. State election law prohibits authorized and unauthorized committees from coordinating fundraising and expenditures in order to evade donation limits. There's strong evidence Friends of Lovely Warren and Warren for a Stronger Rochester coordinated from the start. The law defines coordination as common operational control and communication about the activities of both committees. The treasurer of the PAC is Rosalind Brooks-Harris, who is Warren’s Deputy Finance Director at City Hall. The PAC’s registration form lists Al Jones, the treasurer for Friends of Lovely Warren, as authorized to write checks. Reimbursements over the life of the PAC show checks made out to Warren herself and her campaign manager, Brittaney Wells. Friends of Lovely Warren and the PAC shared vendors and consultants. The same people ran both committees — and they presumably answered to Lovely Warren. There’s other evidence on coordination that is damning. The PAC hosted the 2016 Mayoral Ball, which required the active participation of Warren and her entire team. In early 2017, Warren’s campaign website solicited donations that went to the PAC. In October, City Hall graphic designer John Hawk refunded $4,630 he was paid by the PAC between July and September. The campaign account paid him $5,640 in October. This suggests Hawk was paid out of the PAC account in error. It also suggests Warren may be trying to clean up the mess she's created. Whatever the case, the episode is a clear case of coordination. Perhaps the most disturbing evidence of coordination is what happened in March 2017. The PAC transferred $30,000 to Friends of Lovely Warren. Warren explained the transfer to the Board of Elections as a “PayPal error,” which is impossible. Someone had to deliberately transfer the money. The transfer was also explained as two donors writing checks to the PAC when they meant to write checks to Friends of Lovely Warren. The proper way to handle such a “mistake” is to refund the donors’ money. The entire transaction demonstrates joint operational control and an attempt to move PAC money where it was not subject to the same spending restrictions. Warren got personal and political benefits by having this second, likely fraudulent, political committee. The motive for running this alleged scheme becomes even more clear when you look at what Warren has left in her campaign coffers. Her campaign wouldn't have been able to sustain the PAC's spending without over-limit donations. As of the 11-day pre-general filing, the campaign has $128,822, not enough to cover the $145,654 in questionable expenditures made by the PAC. The total amount of the PAC's questionable expenditures roughly equals how much the top 28 donors collectively gave over the legal limit. The PAC still has more than $150,000 left, but it's doubtful Warren will get away with spending that money on herself again. If Warren isn't held accountable, a broken campaign finance system will be forever destroyed. Warren's campaign finance activities have received little media scrutiny. Gotham Gazette published an article in July that raised the question of whether the PAC was being used to finance her reelection campaign. New York Public Interest Group Executive Director Blair Horner said the allegations against Warren and her groups are serious enough that they warrant scrutiny by (Risa) Sugarman, whose job is to identify and investigate potential violations of campaign finance law. “New York’s campaign finance system is already riddled with loopholes. If the allegation is true, allowing this arrangement would demolish whatever limits still exist,” he said of using a PAC as a second campaign committee. Susan Lerner, executive director of Common Cause NY, said this practice is virtually unheard of, and indicates a significant lack of oversight at the county and the state levels. "It seems to be a flat out disregard for the law,” she said. As the Gotham Gazette noted, the state Board of Elections doesn’t have the resources to investigate these cases quickly. Media reports indicate its enforcement team is still working on complaints that came in last year. There’s nothing stopping the New York Attorney General, however, from stepping in right away. Warren and her team could face dozens of counts of felonies and misdemeanors. It’s a felony to coordinate over-limit donations for the purposes of aiding a campaign. It’s a misdemeanor to accept over-limit contributions for the purposes of aiding a campaign. Anyone who uses campaign funds for personal use can also face possible criminal charges. Each time any of these things happened amounts to a criminal count. No one has ever used a PAC this way in New York State. Warren’s potential crimes are unprecedented. The electorate was potentially defrauded, as well as donors who may not have known they were being used to exceed legal limits. A person is guilty of violating election laws if their conduct is “willful and knowingly.” Willful is the act of doing something intentionally, purposefully and stubbornly. Knowingly signifies the defendant knew the conduct was illegal and still engaged in the act. Warren is an attorney who has been engaged in politics and elections her entire career. The filings show she exercised operational control of the PAC, as indicated through multiple personal expenditures. 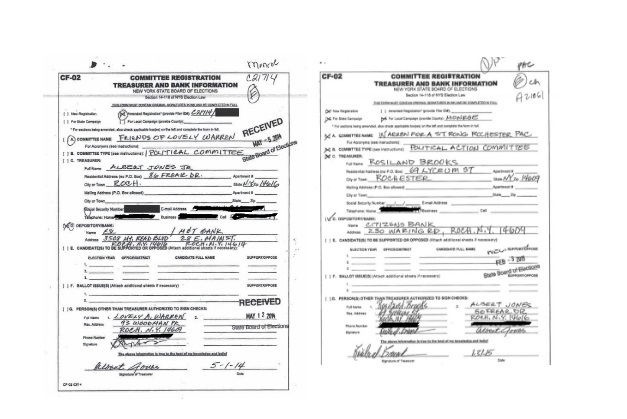 Dozens of expenditures over numerous public filings indicates a flagrant pattern of behavior. The rules for authorized and unauthorized committees are posted multiple times on the Board of Elections website, and on the PAC registration form itself. If authorities don't investigate this matter, there's nothing stopping any candidate for office from opening multiple committees, which would obliterate donation limits and coordination rules. Any person who shall, acting on behalf of a candidate or political committee, knowingly and willfully solicit, organize or coordinate the formation of activities of one or more unauthorized committees, make expenditures in connection with the nomination for election or election of any candidate, or solicit any person to make any such expenditures, for the purpose of evading the contribution limitations of this article, shall be guilty of a class E felony. Any person who knowingly and willfully contributes, accepts or aids or participates in the acceptance of a contribution in an amount exceeding an applicable maximum specified in this article shall be guilty of a class A misdemeanor. Contributions received by a candidate or a political committee may be expended for any lawful purpose. Such funds shall not be converted by any person to a personal use which is unrelated to a political campaign or the holding of a public office or party position. A person is guilty of a scheme to defraud in the first degree when he or she: (a) engages in a scheme constituting a systematic ongoing course of conduct with intent to defraud ten or more persons or to obtain property from ten or more persons by false or fraudulent pretenses, representations or promises, and so obtains property from one or more of such persons. Scheme to defraud in the first degree is a class E felony.